I get lots of questions from MommyMaestra readers about how to start homeschooling, how to raise bilingual children, what bilingual homeschool materials are available and so on and so on. I certainly don't claim to know all the answers, but I do try my absolute best to GET the answers that my readers are looking for. So when Marianna Du Bosque of Bilingual Avenue asked me if I would consider sharing my own journey as a mom trying to raise bilingual children, I told her right off the bat that my kids weren't poster children for being bilingual. Because the truth is, I certainly have my own struggles trying to raise kids who can speak Spanish when I am honestly the ONLY one around who can speak Spanish. But Marianna was gracious and still enthusiastic, so TONIGHT at 8:30 pm ET, I'll be on a Facebook Live Event with her (and will try to share it on the MommyMaestra FB page, too!) talking about our bilingual journey. In addition, I'll be talking about homeschooling - how to start and where to find support - as well as bilingual homeschooling. 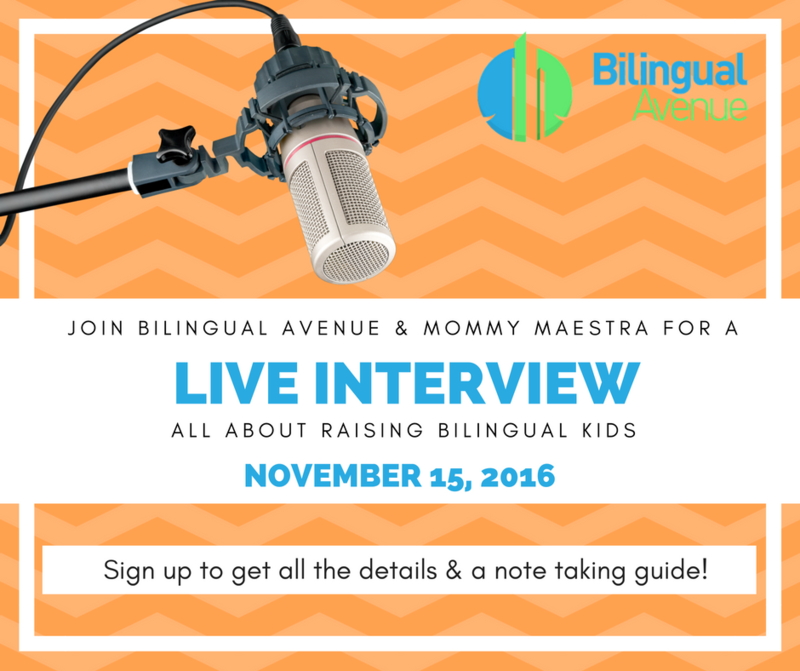 You'll hear which programs I really love for teaching children Spanish, too. So if you've been thinking about homeschooling your children (especially now with all the upheaval in our country), or if you are struggling to raise bilingual kids, or if you just want to chat with me, I hope you'll join us! The coolest part, I think, is that Marianna has created a free reflection guide that you can download and keep notes or write down questions. Oh, and you can send in your questions, too, before (or during??) the event and we'll do our best to answer them. Or just stop by and say "hola" and share one of your struggles or successes! They inspire us, too. So sign up here to download your free reflection guide and even have a reminder sent to you.